In order to talk about pricing the following wedding statistics may help and shock you, but they are true & from well known reliable sources! Read them all here and learn from other Brides & Grooms mistakes! It will make you rethink your Wedding Reception Priorities and what you are looking for in a DJ to start with. 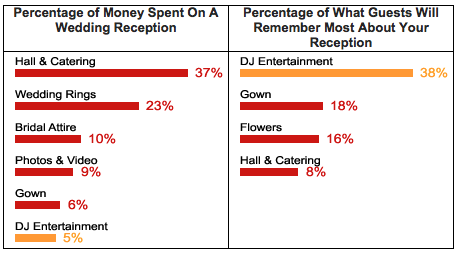 When asked 81% of guests say the thing they remember most about a wedding is the entertainment (Band / DJ). 65% of all couples that chose a band to entertain at their wedding reception, said, if they had it to do over again, they would have chosen a disc jockey! Sources include: Simmons; USA Today, National Bridal Service, The Knot, Brides Magazine. Wedding Disc Jockey rates are vary based on talent, experience, emcee ability, service, coordination, equipment needed, music knowledge, mixing ability & personality. Not all Wedding DJ’s are Created Equally, as many of you know – we have all seen the “Bad” Cheesy Wedding DJ! The reality is good entertainment is not cheap and cheap entertainment is not good. You know you are going to pay more for a Mercedes, than you will for a 1978 pinto. Luckily with Kiss Me Entertainment you can have the luxuries and security of a Mercedes wedding for not much more then you would have paid for the pinto anyways. We can do this by customizing your events to your needs. How Much Does a Wedding DJ Cost in the Florida Keys? Rates for the DJ industry vary greatly, ranging from $500.00 to $5,000.00 with an US average of $900-1,600.00 for a 4-hour reception. We try to stay inline with the national average many things can reduce or increase prices such as additional time, additional equipment for ceremonies cocktail or cocktail hours, in addition many people choose additional options such as lighting or video. Please call or email to schedule a consultation with us. During our meeting, we will be more than happy to provide you with an exact quote for your special event. There is NO pressure, and your price will be based on your specific needs. More Wedding Information You might want to know! The best price is not always the best deal, especially if you are planning a wedding. As the surveys above conclude that 100% of brides would have spent more money on their entertainment made it their #1 priority in hindsight! A Professional Wedding Entertainment company will normally invest 12 to 30 hours. Consultations, music purchasing & editing, preparation, set-up & tear-down, education, phone calls, travel & other business related endeavors add up to the overall success of your special once in a lifetime day. Sources like The KNOT and Modern Bride Magazine state, Entertainment is 8-10% of your Wedding Budget, but TWICE as many guests will remember your entertainment, more than anything else! When you’re spending thousands of dollars on a once-in-a-lifetime event, doesn’t it make sense to reserve the finest entertainment, especially since it is only 5% of your over all budget?? Yes, your Gown & your Food are very important. Still, the selection of Music Entertainment can determine the success of your event! A qualified Wedding MC can guarantee your guests will stay after dinner to party; the Photographer & Videographer will have something to shoot & your guests will stay long enough to really remember your gown! You can save money by booking all your vendors early and if feasible booking on off days and off seasons. Because all the great vendors will be booked sometimes up to a year or more in advance! You don’t want to be “stuck” with who is left! There is usually a good reason why a vendor is not booked 2 weeks before your wedding! In the Florida Keys Most people treat the wedding as vacation and they are here during the week. Maybe consider getting married during the week save substantial money. Typically the only reason people get married on Saturday is because it is the day most people are off work. But, if you and your family are in the keys during the week I guarantee you aren’t working. Good Luck with all your Planning and remember that sometimes the smallest overlooked detail may have the largest impact on the SUCCESS of your Wedding Reception!